Order your Yamaha EMX5014C Powered Mixer from AMS and enjoy 0% Interest Payment Plans, Free Shipping, Free Extended Warranty & 45 Day Money Back Guarantee. 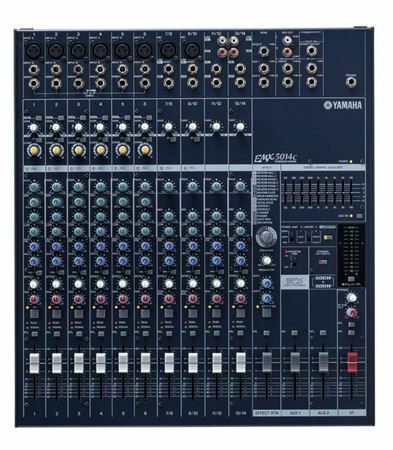 The Yamaha MX5014C is a Console-Format Powered Mixer for Advanced Live Applications. When sound reinforcement requirements get serious but you still want the convenience and reliability of a Yamaha powered mixer, the console-style EMX5014C is the ticket. It’s an all-in-one solution that's ideal for everyone from bands to venue operators alike. It provides a surprising palette of features and versatile signal routing options. And it’s a Yamaha, so you can trust that it’s going to sound great. The EMX5014 delivers the winning combination of superior sound quality, convenient mixing control, and reliability that has made the Yamaha EMX Series the top choice for bands, personal studios, houses of worship, corporate and educational facilities. Compact packages, versatile input capabilities, plentiful power and top-quality, built-in signal processing are standard equipment. Yamaha brings a new member to its EMX family with the introduction of the EMX5014C. I use this mixer for soloing and with a 4 pc band. Excellent mixer for my keys and vocals. Originally I purchased the Emx 7. It didn't quite fit the bill. American made the return and exchange painless. I received the EMX5014c within 2 days. No down time. Great mixer, great service. This is a great mixer, I use it to run all the musicians through at church. I power two Yamaha 15inch speakers with great clarity no problems. The on board effects are awesome. Bass , three keyboards,and kick drum, sounds great. Eliminates having multiple amps on stage. I am a live sound novice, and have been very pleased with how user-friendly this mixer is. A great sound, and I’ve been able to use it with a 7-8 piece band with no problems. Plenty of power for acoustic and band use.easy to transport sets up very readily. Also very durable.Love it! Love it.plenty of channels and ample power.easy to dial in sound and effects. Took to a gig two days after it came in. The board is easy to figure out and works very well. I would suggest going through all of the effects to see what sounds best to you. I also own Yahama club series speakers, so the YSP feature is a plus. I was using 10 ft patch chords, but unlike my previous board, the patch is near the rear so I would suggest 15ft chords. Excellent sound!! Well made, but buy or build a case!! Plug and play if this is not your first board. If it is, take a few minutes with the manual. I've used this board for nearly 3 years with no problems whatsoever. It sounds great! 2 Aux sends and awesome built-in effects, sub-woofer outputs, very versatile mixer. Very easy to set up and use. Still a good idea to read the manual. Clear and loud. Great effects! Just had the sound system for two weeks, & so far I'm very happy with it. My old system was from the early 80s so there's quite a difference in sound quality, power & options. Oh, also the weight, what a treat that I can actually lift it. The yamaha speakers sound great, although I'm not sure yet about the outer covering being carpet. Time will only tell. It was very easy to set up for the first time. The manual is very helpful. I am quite pleased with the tone.